Lake Cle Elum Vacation Rental #9447 LakeHouseVacations.com Rent Me! Prospector's Point in Suncadia! 2 Masters WiFi Walk to Golf & The Spa! Luxury Vacation Home in Suncadia! Great Value * Hot Tub * Specials! "Moon Rise Trail" is located in the heart of Suncadia Resort, just a short walk from the award winning Prospector Golf Course clubhouse and the Canary Bar & Grill. Just out the backdoor is the Suncadia trail that will lead you on a walk or bike ride through the scenic resort and its many kid friendly parks. This luxury home features four bedrooms including 2 Master Suites, and 3.5 bathrooms. Eleven guests can sleep comfortably on beds. This well designed home features a comfortable great room with a fantastic outdoor living space complete with a 6 - 8 person Hot Tub, and a Gas Fire Pit! The whole family will enjoy the free high-speed, WiFi Internet access. The well stocked Kitchen features stainless appliances and a large center island for preparing great in home meals. The large dining table seats 8 comfortably, with additional seating at the kitchen bar for 3. Just off the kitchen is the very comfortable living room that boasts a Gas Fireplace, 60" Flatscreen TV with Dish Network and DVD Player! The oversized and comfy sectional is great for relaxing and taking in your favorite TV Program or Movie. The main floor of the home is accented by hand scraped hardwood floors. Just down the hallway is a powder room. Just down the hallway on the main floor is one of two King Master Suites! This Bedroom features a Flatscreen TV with Dish/DVD, and a beautifully designed tile master bath. Just up a flight of stairs to the 2nd Floor and you'll find an additional King Master Suite and 2 Guest Bedrooms. The 2nd Floor Master boasts a private bath, and a Flatscreen TV with Dish Network. At the other end of the hallway you'll enter the two Guest Bedrooms that share a "Jack and Jill" bathroom. The kid's "Bunk Room" is furnished with a Twin over a Full Bunk with a Twin Trundle underneath. This room sleeps 4. The additional guest bedroom features a Queen Bed. These 2 bedrooms both have Flatscreen TVs with Dish Network. This is an ideal getaway for two to three families. The central location of the cabin in Prospector's Reach makes it a fantastic destination to enjoy all the Resort's activities including golf, hiking, bike riding, ice skating, winter tubing, cross country skiing, snow shoeing, horseback riding, and river rafting! You'll also enjoy gourmet meals at Suncadia's Portals Restaurant, The Canary Lounge, and Swiftwater Winery! Walk to golf at the award winning Prospector's Golf Course, or take a short 1 mile drive through the resort to enjoy Suncadia's newest public course, Rope Rider! FOR LARGER GROUPS YOU CAN ALSO RENT OUR SISTER CABIN, PROSPECTOR'S POINT, THAT IS ALSO LOCATED IN PROSPECTOR’S REACH. **You can park a maximum of 4 cars at Moon Rise Trail. 2 cars will fit in the garage and 2 in the driveway. Additional vehicles will need to park at the Inn at Suncadia just around the corner as there is no street parking. We stayed for 3 nights (2 families of 4) and it was absolutely perfect! We packed in sledding, skiing, hot-tubbing, dinner at Swiftwater, and spa time for the moms. The kitchen was perfectly appointed with everything we needed for family meals, and the house layout was great for putting kids to bed while parents continued the fun times. Only thing that would be great to have there would be some beach towels for the hot tub. We love the beauty and convenience of Suncadia and will definitely be back! " The home was very nice and comfortable. the one HUGE ISSUE we had was that even with a "nice" cleaning fee paid upfront, we were still required to strip the beds, wash all the towels and take the trash out. With the cleaning fees paid, one would think that they would at least have cleaned out the coffee maker, dumped the grounds, and run the dishwasher with the last occupants dirty dishes in it. " We had a wonderful time. The place was immaculate! The houses are close together and there was quite a bit of noise late Friday night. The kitchen was well stocked with the exception of no sugar or plastic wrap. Also, the garbage restriction of one 13 gallon bag per stay seemed a bit off. With 9 people, we ended up taking home garbage and recycle in our cars. Being able to leave 2-3 thirteen gallon bags seems more reasonable. Overall we had a great time and would refer others to this home." Overall, the rental was good for our family (three sisters plus spouses), 3rd night free, plenty of room, clean, and kitchen was fairly well equipped, and appreciated lots of towels! Negatives would be some cleaning and amenity details (i.e. dead bugs in kitchen lamps, internet was spotty at best, fire pit flames very low and not adjustable to get more heat, no hair dryers). My other comment would be the multiple, multiple emails from the property management company. Seemed very excessive. " The home is large and lovely and clean. Very comfortable. TVs in all rooms is nice. Bathrooms great throughout. Only downside which was actually an issue was lack of cell service (not fault of house) and lack of reliable Wi-Fi connection. " "Fabulous Stay at Moon Rise Trail! Our family and extended family (group of 10) truly enjoyed our long weekend at Moon Rise Trail! Everything about our stay from the clear communication prior to arrival to having most everything we could possibly need in this beautiful home to specific instructions for departure was excellent. The home is clean, nicely decorated, well-appointed and in a great location. The only issue we had was internet seemed to be very slow. Using a personal hotspot on our phones was an easy fix. Other than that, everything was great! We would highly recommend this property to anyone staying at Suncadia! " "Immaculate home convenient to all the area has to offer. The house was the perfect size for our three-couple getaway. We vacation together every year and rent homes in various locations. This was the absolute cleanest home we have rented; it felt brand new. We loved how close the house was to the quaint town of Roslyn where we spent two afternoons. We also enjoyed how we could go for walks or jogs for miles right from the house. Several of our party rented mountain bikes in Roslyn and spent a day biking. We didn’t realize there were so many things to do in and around Suncadia. We wish we could have stayed a few more days. Checking in and out was seamess." The home was beautiful and worked for what we needed it for. At the time of arrival, I realized one of the garage doors wasn't hooked up to the motor therefore we couldn't open the door to park a car inside. It was an easy fix with a ladder if you know what you're doing but could've caused issues with someone else's stay considering I didn't get a reply from the rental company until the next morning. Also noticed the side door to the garage was unlocked upon our arrival so anyone could've entered the property. The home's location right off the main road made for a lot of road noise and not a lot of privacy - not to mention the home is REALLY close to its neighbors. Luckily it was raining our entire stay so we didn't spend any time outside. The kitchen was lacking some essential items (pizza cutter, etc) but otherwise was pretty well stocked. I'm not sure how it sleeps 11 people considering there are 3 beds (2 people each) and 1 bunk bed (slept 3)..unless you're counting 2 people on the couch. But overall, the place was nice and worked for our weekend getaway. I wouldn't rent this particular house again though." We had such a fantastic time at this property! It is centrally located to the hotel, Swiftwater, spa. We had 3 generations of family (6 adults, 2 kids) in the house at one time and we had commented that the design of the house and furniture made it feel much larger and we never felt short on space. The hot tub and outdoor fireplace were a big hit. The kitchen is very well appointed with plenty of space for cooking, mingling, and dining. We took the bikes provided at the house out and rode to Swiftwater for a glass of wine. We will definitely return!" We had an amazing time and the home was perfect!!! Had everything we needed and then some. Kitchen was packed with everything it was so nice! Perfectly located so we could walk to tubing and the hotel for a few drinks! Beds were comfortable and cozy. And when we checked in the House was nice and clean and ready. " We had a great time wine tasting at Swiftwater Winery, dinner at the Brick & relaxing back at the house. Beautiful home & plenty of room for everyone. " Perfect venue for a group of friends who had not seen each other for years. We were in town for a wedding and this vacation rental provided the perfect basecamp. The home had plenty of space, was very comfortable, very clean, and very private. It was also conveniently located within walking distance of the Suncadia Inn, which we would visit each day to purchase amazing coffee beverages. We will definitely go back!" The house was lovely. Well appointed kitchen, very clean. Towel pegs in the bathrooms would be helpful. Unfortunately, it's proximity to a construction site and road made for very noisy early mornings. The lack of access to a swimming pool was also a problem. " Excellent, easy booking, payment and arrival." Our family of 7 adults and an infant stayed at this lovely house and it worked perfectly for us. The house was very clean and the configuration really created a pleasant experience for all of us. Our nephew got married at the Lodge at Cedar Creek and the drive was short and easy to that venue." Great place, wonderful management. Very pleased"
Our complaint would be that we left a day early due to a bad weather prediction in the Snoqualmie Pass. We had to get back to Seattle, and did not want to risk getting stuck at Suncadia for several days. As it turned out the weather did turn bad and the pass and I90 were totally closed. Aware of the wording in the contract, we still felt that some refund should have been given to us. One night's rate was about $600. Even a credit towards a future stay would have been welcomed. We think this property would be more fun in the summer." Our family with two daughters and two grandchildren stayed for two nights. Some of us went on a snow mobile trip and others went snowshoeing. Very nice house and wonderful location. Had a great time. We had a wonderful time in the Suncadia Trail home! " We had a wonderful time!" My family stayed here in October and had a great time. The house is clean, comfortable, and perfect for a mid-sized group (6 adults, 3 kids). We enjoyed ending the evenings with card games, s'mores (using the fire pit) and relaxing in the hot tub. " The rental company was great and came to our house to turn on the firepit, but the flame was just not enough to use it. The house was great!" This house worked well for 7 adults and 2 babies. We were grateful for the air conditioning and the well stocked kitchen." Several Family members helped our dear sister Sue celebrate her 60th birthday. The location and Home were fantastic! Couldn't of had a better girls getaway! Great house for a family get-together. Comfortably sleeps 8-9; 11 would be a stretch. Nicely furnished with well-equipped kitchen. Property was clean and well maintained except for overflowing grease trap on the gas grill. One disappointment was lack of access to Suncadia swim club, not even for fee." We had a WONDERFUL experience in Suncadia!! The house was big and clean and had all the amenities that we could think of! Plenty of room for our party of 7 and a baby! Would recommend this to anyone!" This is the 3rd year coming up to Suncadia and we always get a home rental. The home is perfect. We like the fact that we have access to a stove and bbq. And after a long day of golf how can you say no to some time in the hot tub to get you refreshed for the next day. 7 of us stayed in this house for a girls' weekend. We could not have been happier with the house. Clean and in great shape with everything we needed. The rental company was very responsive and helpful as well. Overall a great trip!" Very beautiful home with all the comforts and accesibility"
The home was clean and had everything we needed. We had a great time, despite all the rain! " We stayed here for 3 nights for our son's wedding at Swiftwater Winery. The only unfortunate part is that we were so busy with wedding events, we didn't get to explore much of the area or spend a lot of time in the house. The house was spotless and really well set up to handle our group (3 sons, 1 girlfriend and 2 children). The finishes throughout the house are upscale and the linens are nice. We received lot of communication from the management company and they were easy to work with. I would recommend this to any friends and I would stay here again in a heartbeat." Had a fantastic 3 day stay in this house for around $1000 and then the rental company says they're going to charge me $50 off my deposit because they had to change the water in the hot tub because of something we supposedly did. We did nothing to the hot tub, other than sit in it, yet they wouldn't budge. So if you want to get nickeled and dimed by a company, after the fact, when you've done nothing wrong, this is a great company to work with. " Suncadia trail cabin is a beautiful, big home! We were celebrating my husbands 60th birthday and our kids and first granddaughter came to surprise him. We all had a relaxing, wonderful time and would definitely go back. The only think I can think I would have liked to change is the property is right on the main road to the lodge. But didn't change the fact we had a blast. Even had snowstorm for a bit, in April! Loved the Roslyn Cafe! Just a great time for all! The managers were fantastic though out the whole planning and staying process. Love it!" I was unhappy with the management charging $75 to clean the hot tub, and $50 for a broken hot tub cover clip (when two of the other clips were already broken upon arrival). 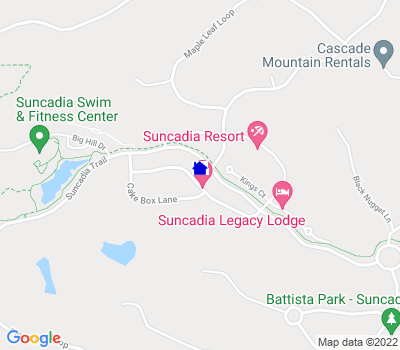 Next time I stay at Suncadia I will book directly through Suncadia Resort." Well stocked home with great bedding which always nice! Home is kind of noisy with a large group and the outside maintenance was lacking as there was dog poo in the entry for two weeks and never cleaned up. The inside was immaculate. Works well for large groups but be prepared to hear every toilet flush or shower run. I misplaced the key for 1 week and they charged me $ 50.00 which I thought was ridulous I found the key 1 week later and emailed them I had found it and they never replied back. Guess the money was more important than the key! I would have a hard time recoomending this place because the "Fine Happy" Property Management Company although ther App for entry was great. Too many NO's for me on this one! " All Seasons Vacations were great and very easy to work with. Had no problems and the home was beautiful and comfortable . Property was clean with nice amenities. We enjoyed our stay and hope to return again! " We had a wonderful Thanksgiving family vacation here at Suncadia Trail. The house was perfectly set up for our family with two kids (8 and 5) and the kids loved the bunk beds. Another family with similar aged kids joined us for one night and it was the perfect size. The kitchen was well appointment and organized with everything we needed to cook breakfast and BBQ some dinners. We enjoyed the short walk to the trail and hiked around to explore the Suncadia property. The mining history and signs were interesting and the kids loved seeing all the trees and plants. The best part was the hot tub and making s'mores around the fire pit. Would highly recommend Suncadia Trail. " "Suncadia Trail...beautiful cabin any time of the year! We celebrated with friends a week of winter holidays at this beautiful cabin. Upon our arrival, the home was clean, music playing and the ambiance felt very welcoming. Plenty of room for a group of 6 adults and 3 kids. Each bedroom has a private bathroom. Great!! No taking turns :) especially great when traveling with kids. The rooms were good size and well furnished. It felt like we had our own sanctuaries to return to end of the day. The kitchen is perfect for cooking and mingling. That kitchen table is a must in every home!! Perfect for a big holiday feast or a group breakfast. The cabin is super close to Suncadia pathways, main lodge, etc. We took advantage of the ice rink. Amazing experience. The overall location is superb. Easy drive to/from Seattle and Bellevue. Last but not least... It's been once again a great pleasure working with the All Seasons Vacation Rentals staff. Very helpful, always available, quick to respond. The automatic electronic update system is pretty handy to keep us informed of any important information about our stay. Thank you!!! PS everything was great. One thing to keep in mind the WiFi wasn't working too well during our stay. Only in certain areas of the house. But if you can, leave your technology aside and enjoy the nature :)"
Home was better than I had expected. We had two families and 4 young kids and there was plenty of space. Very clean and well maintained. Close to the Lodge and some playgrounds. If you are looking for tons of privacy or yard space, these houses are all quite close together, but otherwise a great option. " We had an amazing weekend. The house was a perfect fit for our needs. " Great fun getting together with our family in a beautiful home. It was close to my nieces wedding ceremony and we were able to enjoy the areas attractions as well. I'm glad we discovered Suncadia Trail and plan on returning in the future! " We rented the Suncadia Trail house for a long weekend getaway, and it couldn't have been any better. The house was immaculate, great floor plan, and perfect deck with hot tub, fire pit, bbq... everything you need. I would definitely stay there again! Also perfectly located between the Winery and the Lodge." 3 days in Suncadia for golf. Only downside there was not wi-fi available." The house worked out very well. We were hosting a wedding at the Inn and needed additional lodging. Close location to walk to the Inn, Lodge and activity center. Staff was very helpful with any questions that I had. They have a new automated system that helps with information, etc. House was very clean, nice size rooms and equipped with what you would need for your stay." Really great place. Close to the main lodge and lots of amenities. Fire pit, hot tub big kitchen and great room. Enjoyed staying here with our family and we'll definitely be back..."
Would have liked a few more amenities like stereo system but all in all it was a great place." We had a wonderful time at Suncadia. We were celebrating my husband's birthday along with friends and couldn't have had a better time. The home we rented was perfect!" We had a great time at this property. It is off a main road and in a community where the houses are quite close together, but great layout and good amenities (hot tub, fire pit, etc.)" the description of cabin doesn't do this house justice - it was beautiful and very comfortable. Beds were very comfortable and everything was pristine. It has a great location and close to the lodge and pool. It was a little light in kitchen utensils but bet that will change quickly as more people book. Lack of WiFi was a bit of a surprise but our bad for not asking beforehand and frankly it was nice to be disconnected. Kids loved TVs in their rooms. "